Global Running Day is an annual initiative designed to encourage individuals of all ages and abilities to get active. Getting involved is easy, just take part in some type of running activity on June 1, 2016. Add you name to the list of runners from all over the world who are coming together to celebrate the sport by signing the pledge now! Not sure how to commemorate Global Running Day? Celebrate with the Hartford Marathon Foundation and Fleet Feet West Hartford at our All 4 Run event at Riverside Park in Hartford on June 1, from 5:00 - 7:00 pm! 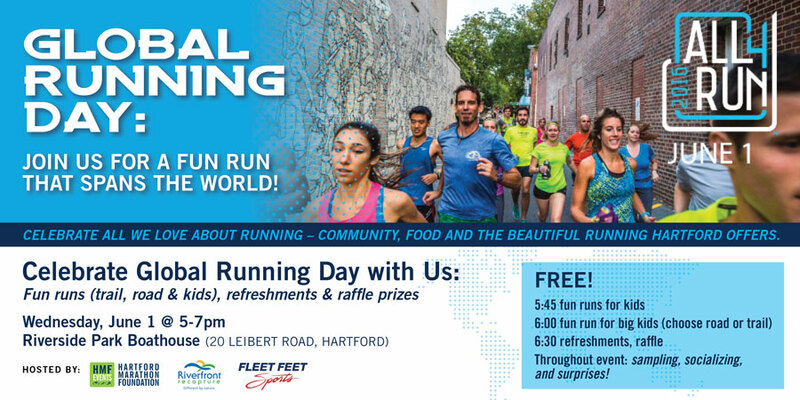 The All 4 Run Global Running Day celebration will feature fun runs (on the roads and on the trails), a special fun run just for the kids, refreshments, giveaways, and special promotions! Beer! We love it just as much as you do - really, you should see our office fridge (Kidding...well, sort of). As it turns out though, we may have inadvertently been doing the opposite of following the rules when it comes to beer at early Sunday races. We don’t want you to be disappointed when beer is no longer part of celebrations at races we’ve traditionally raised our glasses at – including this Sunday’s Shamrock Duathlon and 3.3 mile run. Ok, you can be a little disappointed, we get it – but please don’t take it out on us for being rule followers, albeit a little late to game on this one. It was brought to our attention that beer is not allowed to be served before 11:00 am on Sundays in the state of Connecticut. So, we’re focusing on how to replace the cold post-race brew. It’s slightly impossible to do, but we’re making some serious effort here. This weekend, we’ve got Irish Stout Ice Cream Floats. Look forward to refreshing root beer, Coke or cream soda with Irish stout flavored ice cream made especially for us by Shady Glen in Manchester. If we can’t serve beer, we can try to mimic its deliciousness in a made-with-love cold treat. What do you think, good idea? The Women’s Triathlon and Surftown Half Marathon & 5K will also be affected by these silly little things called “laws”, blah. But don’t worry, the Harpoon Beer Garden at the Eversource Hartford Marathon & Half Marathon is safe – no complaints about a Saturday race knowing if you’re 21+ with ID you get the beer afterward! We’re open to ideas, how do you want us to replace the brew at the post-race party?